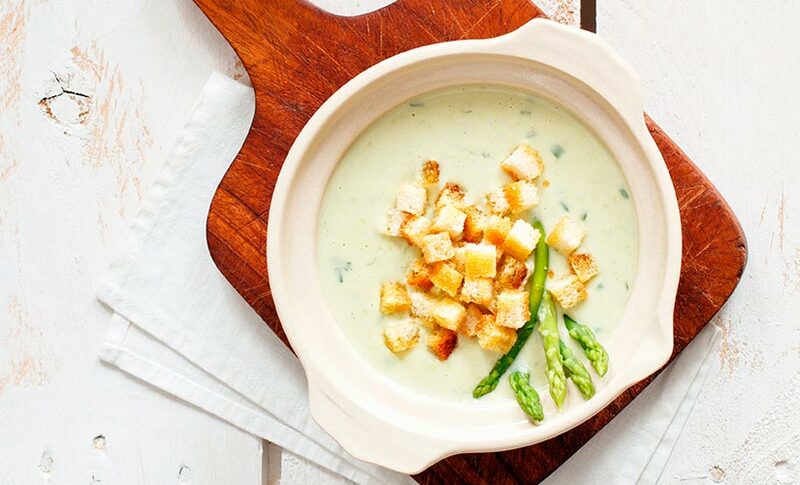 The cream of white aspargus recipe has a high nutritional value and low fat content, so you can prepare this yummy dish at any time of the year (although aspargus is a summer seasonal food). Aspargus has many benefits: a rejuvenating effect, it promotes skin regeneration and it is a blood tonic. We have a wild aspargus with certificate of origin in Spain, the Huétor- Tájar, thay you might want to use for your recipe. Let’s get started! Remove the hard part of the aspargus stems and the and lightly peel the remaining asparagus with a small knife or potato peeler. Once you have cleanes the aspargus, deep them into water with parsley. Cook the trunck of the aspargus. Put it to boil for some minutes, depending on aspargus’ thickness. If you stick them easily with a fork, then it means that you can remove them from boiling. Put the stock to one side. Mix the drained stems in a blender and cover it with the stock. Also add a glass of water, and add the salt, pepper and nutmeg to it. Mix it all in the blender. Strain the outcome so that no large pieces remain. Once it has cooled a bit, we add the crème fraìche (add more crème if it is not thick enough). Move it slightly and then serve it. You can garnish your dish with ham, croutons, sesame seeds or green aspargus cut into pieces.